(Nanowerk News) Future applications of quantum information technology, e.g., ultimately secure data transfer protocols, will be based on data encryption by sequences of single photons, i.e., the smallest and therefore indivisible quanta of light. As possible candidates for such special kinds of light sources, so-called quantum emitters inside a micro-resonator can be used. As a consequence of initial excitation into an excited state, the quantum light source can emit one -- and only one -- single photon. According to the predictions of conventional atomistic models, the effect of coupling (i.e. energy exchange) between a single emitter and the surrounding resonator could occur only under the conditions of strict resonance, i.e., precise spectral matching of the photon energy with the energy of one resonator oscillation mode. Physicists of the ‘Institut für Halbleiteroptik und Funktionelle Grenzflächen‘ (University of Stuttgart, Germany) under the direction of Prof. Peter Michler have now revealed new insight and facets of the effect of non-resonant coupling, which go beyond the conventional atomistic model. Their investigations were particularly focused on semiconductor quantum dots in micron-scale pillar cavities (resonators), grown by a collaborative research group (Prof. A. Forchel) at the University of Würzburg (Germany). The new results have been recently published in the magazine of Nature Photonics ("Non-resonant dot–cavity coupling and its potential for resonant single-quantum-dot spectroscopy"). Schematic representation of non-resonant coupling between a quantum dot (QD) and a resonator mode via phonon-mediated interaction (Figure: Ulrich/University of Stuttgart). As promising candidates of versatile quantum emitters, so-called quantum dots, i.e., artificial nanostructures of crystalline semiconductor material embedded in another bulk semiconductor layer, are highly suitable due to the possibility to design and tune their spectral properties over a wide range during the growth process. Furthermore, the dynamics of spontaneous photon emission from a single quantum dot can also be manipulated by inserting the emitter into a high quality micro-resonator. For the current studies, circularly shaped semiconductor micro-pillars of 1-2 micro-meters diameter are used, which were grown and structured at the University of Würzburg. In the center of each of these micropillars, a single dilute layer of quantum dots is embedded whose electronic and therefore optical properties are specifically designed. The micro-resonators are basically defined by a top- and bottom mirror pair, each composed of multiple sequences of thin Aluminum-Arsenic (AlAs) and Gallium-Arsenic (GaAs) layer periods. According to Dr. Stephan Reitzenstein, member of the ‘Technische Physik’ department of the University of Würzburg, “This special design provides high-quality optical cavities with the ability to spatially confine single photons on a length scale of the light wavelength in all three dimensions”. From detailed optical investigations of these kinds of micro structures, the effect of ‘non-resonant emitter-mode coupling’ -- beyond the strict conditions of full resonance predicted by the established atomistic model -- has now been observed by a group of researchers of the IHFG at the University of Stuttgart. Based on systematic spectroscopic investigations it could be demonstrated that photon emission via a mode of the micro resonator (being coupled to a single quantum dot) is possible even under strong spectral detuning between the emitter and mode, i.e., different emission frequencies of both systems. ‘At first sight, this effect is fully unexpected. But on the other hand, it reflects the influence of strong light-matter interaction in those semiconductor systems which will consequently have major impact on the design and functionality especially of future quantum dot-based emitter devices’, says Prof. Peter Michler. As a major driving process of non-resonant emitter-mode coupling, the effect of ‘pure dephasing’, i.e., loss of coherence in the system without the emission of a photon, especially through interaction with phonons (= quantized oscillations of the crystal matrix) seems to play an important role. The published detailed investigations are therefore an important contribution to help the ongoing controversial discussions on the physical interpretation of the phenomenon of ‘non-resonant coupling’. As was shown in addition by the authors in their Nature Photonics letter, non-resonant coupling can be specifically used as a new tool in spectroscopic investigations of resonantly excited single quantum emitters. 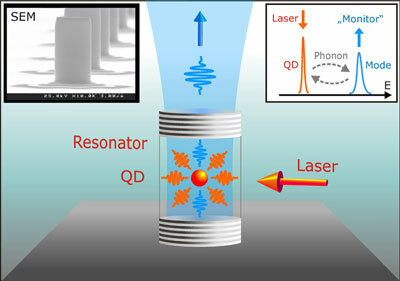 From numerous studies on different quantum dot-microcavity systems, the detuned resonator mode was demonstrated to serve as a direct ‘monitoring channel’ of the resonance fluorescence characteristics of the nearby quantum dot. By this technique, fundamental characteristics in terms of, e.g., electronic fine-structures, ground state absorption saturation, or background-free single-photon emission statistics can be observed in highest detail. According to Prof. Michler ‚this indirect observation of quantum dot-specific properties by coupling the ground state resonance emission to a ‘monitoring mode’ provides a powerful tool for the sophisticated analysis of single quantum systems’.